In current hyped startup environment millions of youth are finding themselves on this cross road and are asking this question – “Should I leave job to begin a Startup?” This can be a classic situation for few particularly if one is at beginning of the career or have been in a job for few years but doesn’t have enough money or strong support system. In 1998 with 14 years experience, I found myself in similar situation. I gave up my job, wanting to start my business and went to a bank for help. By that time I had already have invested my five months (of working along with being in job) of time and entire life savings. Bank Branch Manager was a wise man and gave me a patient hearing. That day I understood that green field projects blinds the person who had spent his time and energy in conceiving them and often commits mistake by over committing his capabilities and resources and mostly fails. I immediately took up another job which paid me half salary than my previous job. I worked another few years before I became entrepreneur in 2003. My best advise to all such people will be that get second opinions on your plans from minimum 5-6 people having different level of experience and seek more clarity on the scope of business which you have been incubating for a while. Please listen them carefully and don’t rubbish what they say. At this staged this is worst thing you can do that you become biased of your own thinking. If after consulting few people answer is encouraging than second point which you need to consider is to get in to deeper project viability and market demand evaluation mode. Prepare a detailed document on all aspect of business. This is where most of people go wrong as they make their plans in their mind and feel that what they are thinking will happen in reality. But when they start with business implementation, they encounter realities of business. So don’t fool yourself and prepare well. Third and most important point is that how you are going to manage your living. Family support both financial and mental. How many months you can sustain yourself or your family without earning? If you don’t have enough savings than it might be worth leaving the current opportunity as that may put you and entire family under stress and pressure. Lastly, trust your destiny. If you are a honest doer and destined for good things in life than opportunity will knock your door again. This is not end of the world for you. May be next time you are in better position with right skills at your side and ready to grab the opportunity and make maximum out of it. 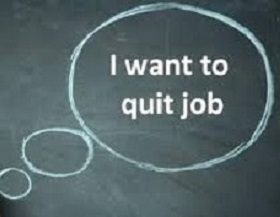 Should I leave a job to begin a startup?